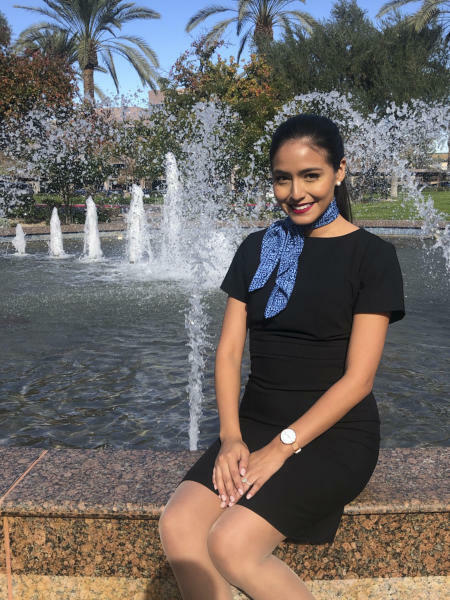 A Texas flight attendant who was enrolled in the government's program for "Dreamers" flew to Mexico for work and was stopped by immigration authorities who forced her to spend more than a month in detention, her attorney said. Selene Saavedra Roman, 28, who immigrated illegally to the U.S. as a child, was released Friday from a detention center in Conroe, Texas, according to a statement from Immigration and Customs Enforcement. "Being released is an indescribable feeling," she said through a spokesman. "I cried and hugged my husband and never wanted to let go. I am thankful and grateful for the amazing people that came to fight for me, and it fills my heart. Thank you to everyone that has supported. I am just so happy to have my freedom back." Soon after her lawyer, her husband, the airline and a flight attendants' group publicly demanded her release, Saavedra Roman called to tell her husband she was getting out. "She was crying and she said, 'Please come get me,'" her husband, David Watkins, told reporters. U.S. Citizenship and Immigration Services — the agency that oversees the program known as Deferred Action for Childhood Arrivals, or DACA — declined to discuss the case. But the agency says on its website that participants who travel outside the country without a special document allowing them to do so are no longer covered by the program. The agency no longer issues the document to the program's enrollees, according to the website. People enrolled in the program are commonly referred to as "Dreamers," based on never-passed proposals in Congress called the DREAM Act. The Trump administration sought to end the Obama-era program but was blocked by litigation. New applications have been halted, but renewals continue for hundreds of thousands of immigrants already enrolled. In a joint statement with the Association of Flight Attendants, Mesa Airlines chief executive Jonathan Ornstein apologized to Saavedra Roman and asked U.S. authorities to release her, arguing that it was unfair to continually detain someone "over something that is nothing more than an administrative error and a misunderstanding." "She should have never been advised that she could travel," Arroyo said. "It was a big mistake." Saavedra Roman — who is scheduled to appear before an immigration judge in April — attended Texas A&M University, where she met her husband. Watkins said he was not initially worried about her assignment because they already obtained approval from Citizenship and Immigration Services to apply for her green card as the wife of an American citizen. She has no criminal record and has long paid her taxes, he said, and she checked with her employer before the trip. Then she was detained. He could visit her only once a week and could only see her through thick glass. She sounded hopeless, he said. "I told her, 'Even if you get deported to Peru, I'll just go with you,'" he said to reporters. "Regardless of whatever happens in the future, I am not giving up. I am going to keep fighting." In a statement, the union representing Saavedra Roman and her colleagues said the event "highlights the urgency of commonsense immigration reform and resolution for America's children who are part of DACA."